Radishes may seem spicy — but they’re not. They don’t have any spicy flavor compounds in them, the way chili peppers do. So why do they taste spicy when you bite into them? The radish is an entirely objectionable vegetable. It provides almost no energy, has the density of a marble, and tastes like pepper spray. The radish is eye-wateringly spicy every time you bite into it. But when you don’t bite into it, it isn’t spicy. And no, that’s not semantics. The radish itself doesn’t contain capsaicin, or any other spicy molecule. If left alone, it’s completely bland. 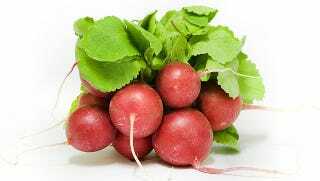 The molecules that give us a peppery jolt when we bite into the radish are allyl isothiocyanate, which do not exist inside whole radishes. Instead, the radish’s cells are full of glucosinolates. These compounds contain sulfur, so they have the potential to give us that nose-tickle we get from spicy foods, but they don’t give us what we think of as a radish flavor. Other parts of radish cells contain myrosinase. When a chemical compound ends in “ase” you can bet its an enzyme, which means it will go to work on the molecules around it. Myrosinase is kept contained in its own little chamber until someone bites into the radish, or slices it, or crushes it up. The damaged cells spill out myrosinase and glucosinolates, which mix together. The enzyme breaks down the sulfur-compound, which results in allyl isothiocyanate, and the spicy kick that we taste when we eat radishes. But why should we ever bother to eat radishes? That will remain forever a mystery.